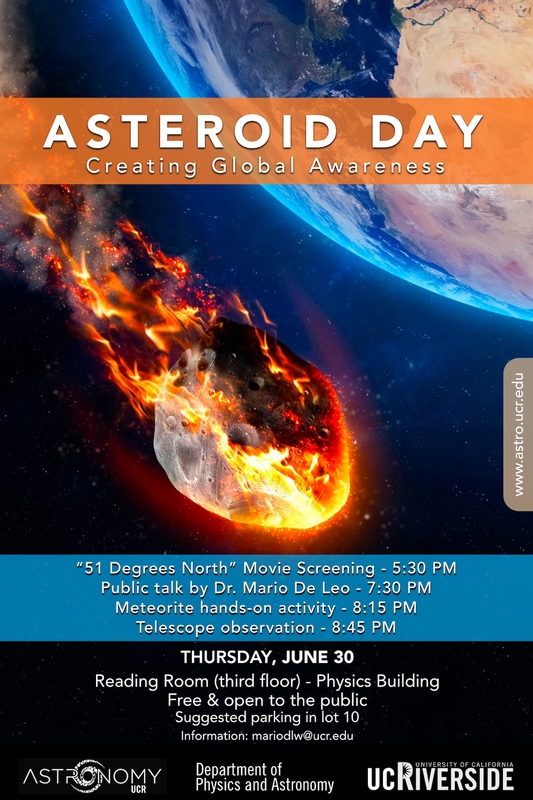 Asteroid Day is a global awareness campaign where people from around the world come together to learn about asteroids, the impact hazard they may pose, and what we can do to protect our planet, families, communities, and future generations from future asteroid impacts. Asteroid Day is held each year on the anniversary of the largest impact in recent history, the 1908 Tunguska event in Siberia. A relatively small asteroid, about 40 meters across or the size of a modest office building, devastated an unpopulated area about the size of a major metropolitan city. Regionally organised large and small events are held on Asteroid Day, and range from lectures and other educational programmes to live concerts and broader community events, to raise public awareness of the need for increased detection and tracking of asteroids. Asteroid day is supported by scientists, astronauts, artists and leaders worldwide, including Prof. Stephen Hawking, Prof. Richard Dawkins and Queen guitarist and astrophysicist Dr. Brian May. Public talk by Dr. Mario De Leo [UC Riverside] Talk on Near Earth Objects, asteroid monitoring, the history of impacts on Earth and scientific research geared to avoid a collision. The Geology Museum of the Department of Earth Sciences at UC Riverside has provided several meteorite samples for the public to touch and get acquainted with. As an added bonus, we will be looking at Mars and Jupiter and talk about those planets’ recent encounters with asteroids. “Early warning is the essential ingredient of planetary defense,” said Rusty Schweickart, Apollo 9 Astronaut, founder of the Association of Space Explorers (ASE) and chair of the Asteroid Day Expert Panel. “Time is the issue. At the current rate of discovery of 20 meter NEOs and larger at about 1000/year, it will take more than 1,000 years to find one million NEOs that potentially threaten Earth. That’s a long time and even then we’d have reached only 10% or so of the Chelyabinsk-size objects that potentially threaten impact.